Anirban Lahiri, who squeezed in as the last man for the BMW, will get to play the full week, as there is no cut at the USD 8.75 million event. Lahiri will be excited to get a full four rounds before his dream event, the President's Cup, for which he was the Captain Nick Price's pick last week. Anirban Lahiri will get his last hit before the President’s Cup when he tees up at the BMW Championships, the third of the four legs of the FedExCup Play-offs. 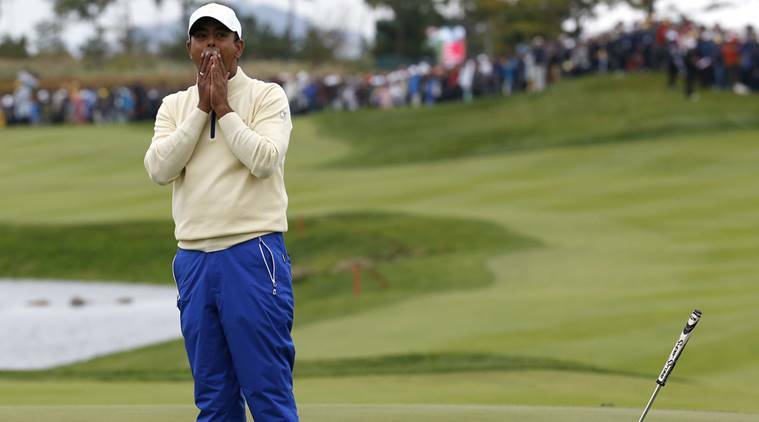 Lahiri, who squeezed in as the last man for the BMW, will get to play the full week, as there is no cut at the USD 8.75 million event. More than anything else, Lahiri will be excited to get a full four rounds before his dream event, the President’s Cup, for which he was the Captain Nick Price’s pick last week. One of the keys this week will be the way the players will attack the course, as there is no cut and the course affords low scores. Buoyed by the confidence shown by Price, Lahiri will be keen to perform well. “I was touched by the faith Nick (Price) and the senior team members had in me to pick me,” said Lahiri. In 2015, a missed putt from three feet cost Internationals a lot as they lost the Cup itself. That is not lost on Lahiri, but he also has the game and heart to get over that and this is his chance. This week Lahiri goes out with Danny Lee in the first round, late in the afternoon. Lahiri also knows that he needs something a like Top-3 to get into the Tour Championships and it is not something that is out of his league. He did finish tied-3rd at CIMB Classic and was tied-2nd at the Memorial. Meanwhile, the three stalwarts — Jordan Spieth, winner of the Open, Justin Thomas winner of the PGA and the Dell Technologies, and Dustin Johnson, the World N. 1 and the winner of Northern Trust, the first leg of the FedExCup, and who is also the defending champion — will tee off in the lead group. A few names outside the East Lake cutline right now for Tour Championships next week, include Zach Johnson (54), Rory McIlroy (51), Ian Poulter (47), Phil Mickelson (36) and Sergio Garcia (34). They all need a very good week at Conway Farms to make it to the Tour Championship next week.